Drive south along Menangle Road between Macarthur Square and Glenlee and you will see new houses sprouting like mushrooms on the other side of the railway line. The houses are part of a new estate called Macarthur Heights, located on the southern end of the Western Sydney University Campbelltown campus. Some of the new houses are being built almost as far south as the edge of Glen Alpine, which means the nearest transport hub at Macarthur station is almost three kilometres away. But while hundreds of residents now call the estate home, there is no public transport available. 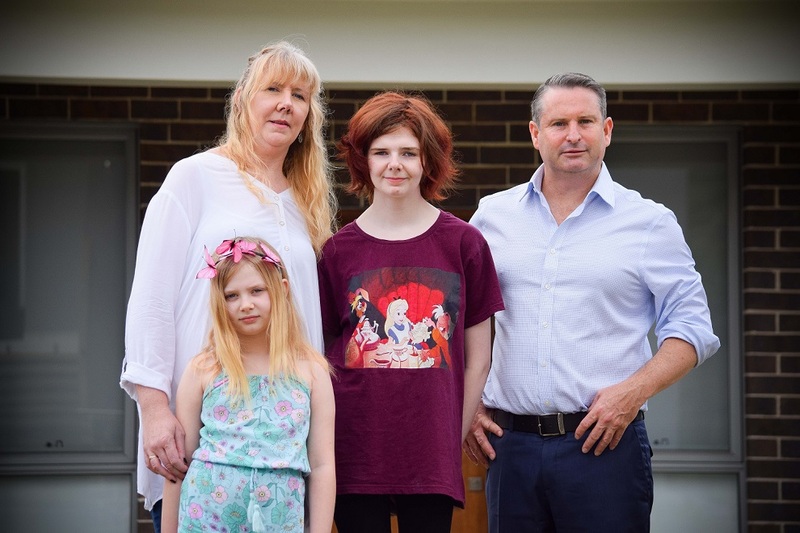 With no bus services operating in Macarthur Heights, some residents like Amanda Pascal and her two children Bella and Lara are forced to either pay for a taxi or walk two to three kilometres to Macarthur train station. New home but no bus service: MP Greg Warren with Macarthur Heights resident Amanda Pascal and her daughters Bella and Lara. Local MP Greg Warren says that’s just not good enough. He said it was inexcusable the state government had left residents in Macarthur Heights stranded. “For eight years this Liberal government have made a concerted effort to make life as miserable as possible for Campbelltown commuters – but enough is enough. “Critical infrastructure like public transport links needs to be in place before people more move into new estates,’’ Mr Warren said. “This Liberal state government has treated Campbelltown and the rest of western Sydney like a dumping ground, where new residents are crammed into every nook and cranny without basic services and infrastructure. Mr Warren said the state government’s attitude of dumping people in new estates and installing critical infrastructure and services years later was impacting in Campbelltown and throughout the entire state of NSW. The local MP recently wrote to Minister for Transport Andrew Constance calling for a bus route through Macarthur Heights to be established immediately. He has also written to local bus company Busabout regarding the residents’ concerns.